An investigational, portable spectral-domain optical coherence tomography (SD-OCT) unit revealed small hyperreflective opacities in both eyes of a patient with bilateral retinoblastoma. There was no evidence of vitreous seeding on ophthalmoscopy of either eye. Although the opacities may initially raise concern for potential vitreous seeding, this report suggests alternate potential etiologies for such opacities, which were also seen on imaging of a cohort of normal eyes in pediatric patients. 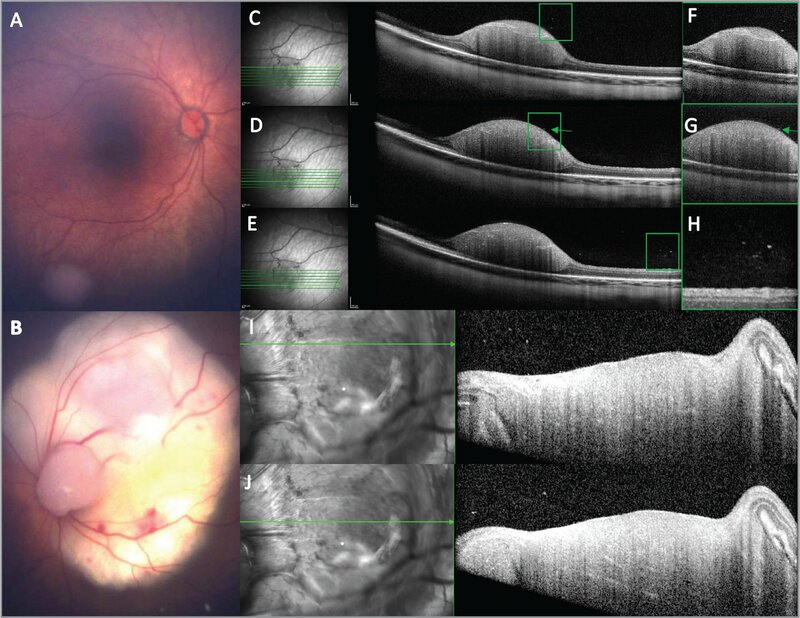 This report demonstrates the first images of retinoblastoma using an investigational portable SD-OCT unit (Spectralis HRA+OCT with Flex module; Heidelberg Engineering, Heidelberg, Germany). We highlight the presence of hyperreflective vitreous opacities not previously reported in small retinoblastoma tumors that may be of clinical import. An otherwise healthy boy was diagnosed with bilateral retinoblastoma at 3 months of age. Genetic testing revealed a positive Rb1 germline mutation. Examination of the right eye revealed Group A disease with a small tumor (3 mm × 3 mm × 2 mm) (Figure 1A). The left eye demonstrated Group C disease with a large macular tumor (15×15×6mm) and localized subretinal seeds (Figure 1B). SD-OCT demonstrated a tumor confined to the inner retina with scattered overlying hyperreflective vitreous opacities in the right eye and a large tumor with similar small opacities in the left eye (Figures 1C–1J). There were no visible vitreous seeds on indirect ophthalmoscopy in either eye. The patient was referred to pediatric oncology for further workup revealing negative MRI of the brain and orbits and lumbar puncture, as well as normal peripheral blood counts. He is currently undergoing systemic chemotherapy with vincristine, carboplatin, and etoposide for treatment of his retinoblastoma and is planned for close monitoring with repeat examination under anesthesia. (A) Color photo of right eye with Group A retinoblastoma. (B) Color photo of left eye with Group C retinoblastoma with a large macular tumor. (C, D, E) Optical coherence tomography (OCT) of the right eye tumor shows small hyperreflective opacities (green boxes highlight areas of opacities). Note the proximity of the opacity to the tumor surface in figure D. (F, G, H) Higher magnification images of the corresponding opacities in C, D, and E. (I, J) Similar opacities were seen in the left eye on OCT. Spectral-domain OCT images were captured with the following parameters: 30° X 5° 7-line scan with an axial resolution of 3.87 μm/pixel for Figures C, D, E and 30° X 25° 61-line high-speed volume scan with an axial resolution of 3.87 μm/pixel for Figures I and J. Three normal eyes of patients without vitreoretinal disease and normal findings on funduscopic exam demonstrate scattered hyperreflective vitreous opacities on optical coherence tomography. These images were captured with similar parameters: 30° X 25° 61-line high-speed volume scan with an axial resolution of 3.87 μm/pixel. OCT is increasingly utilized in the examination and monitoring of pediatric retinal disease, particularly retinoblastoma. As we continue to utilize this imaging modality, it provides new insights and findings not previously described by examination alone. In this report, we highlight the presence of small hyperreflective vitreous opacities on SD-OCT in a patient with bilateral retinoblastoma and no funduscopic evidence of vitreous seeding, as few prior reports have focused on their presence and their clinical significance is still unknown. Although the opacities may be initially concerning for potential shedding tumor cells or vitreous seeds, other potential etiologies for the opacities must be considered, including calcified tumor debris, inflammatory cells, or vitreous aggregates or condensations. 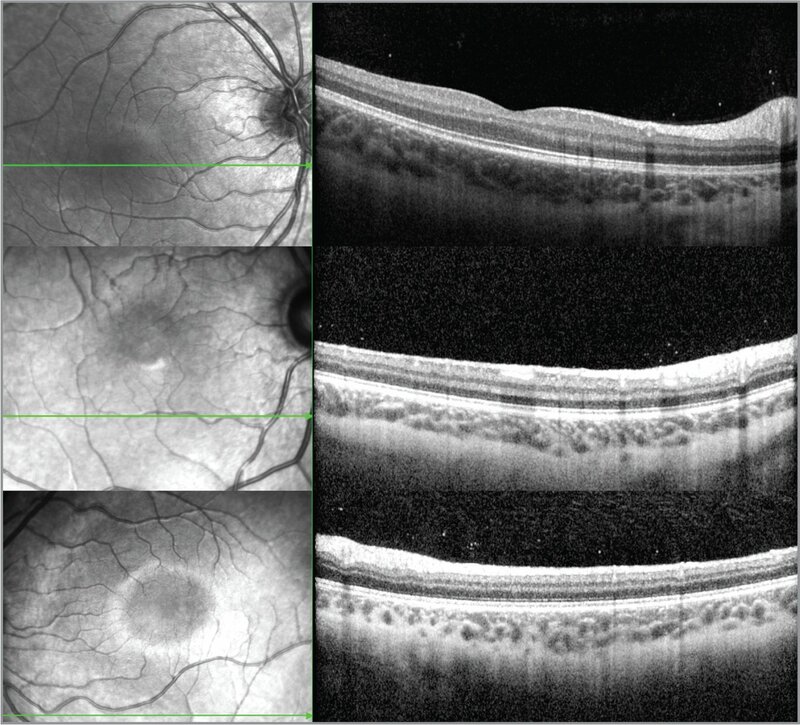 A handful of prior reports describe vitreous opacities on handheld OCT (HH-OCT) as consistent with potential vitreous seeding; however, these tumors were all Group C or more advanced, and vitreous seeding may potentially be seen in such cases.1,3,4 In one such report, similar hyperreflective material, more prominent near the retinal surface, almost disappeared 1 week after receiving an intravitreal melphalan injection; however, the images could not be registered to the exact same location with HH-OCT.3 In an eye with Group A disease such as in the case of our patient, vitreous seeding would be very unusual, leading to our questioning the malignant nature of the findings of OCT. Given the uncertainty of the etiology of the opacities seen in this patient with retinoblastoma, we also reviewed 15 normal eyes of patients from a data set of healthy, full-term children8 (mean age: 13.5 months; range: 2 months to 24 months) undergoing examination under anesthesia for other conditions, including nasolacrimal duct obstruction or strabismus. These patients were also imaged using the same investigational SD-OCT unit and the imaging was reviewed by two experienced graders (APF and RJH). Surprisingly, we found all 15 eyes had greater than 10 scattered vitreous opacities seen on the SD-OCT 61-line scan. Although the opacities in the retinoblastoma patient originally heightened our concern for potential vitreous seeding not seen on clinical examination, the observation that vitreous opacities may be seen in normal infant eyes without inflammation or other vitreoretinal abnormalities, suggests similar opacities in retinoblastoma patients may not be malignant. The etiology of these small subclinical hyperreflective foci seen on OCT remains unclear; however, we favor the hypothesis that this is vitreous debris of an alternate etiology rather than subclinical vitreous seeding. Longer follow-up in a larger patient sample of patients with retinoblastoma prior to and after treatment with comparison to normal eyes is necessary to understand the clinical significance of such opacities in eyes with retinoblastoma. The Autorescan functionality of the Spectralis system with Flex module may provide an additional advantage over prior imaging with HH-OCT as it facilitates registration of imaging for area-specific, long-term monitoring of patients throughout their disease course and treatments. This feature is similar to the tracking software available in many tabletop devices. Although the lack of follow-up imaging after treatment limits the clinical implications of these findings, this case adds to the growing evidence for OCT use in the regular screening of retinoblastoma patients. These findings suggest caution, careful examination, and follow-up prior to making treatment decisions based on imaging alone. As OCT technology continues to improve, access to this imaging modality in treating our youngest patients continues to evolve and will potentially impact treatment and disease understanding. Rotruck J, House R, Enyedi L, Freedman S, El-Dairi M. Spectralis spectral domain ocular coherence tomography in the supine child: Normative reference ranges for children ages 0–5 years [abstract]. Abstract presented at the American Association for Pediatric Ophthalmology and Strabismus 44th Annual Meeting. ; March 18–22, 2018. ; Washington, DC. .
From the Department of Ophthalmology, Duke University Medical Center, Durham, North Carolina. Research equipment for this study (Spectralis HRA+OCT with Flex and OCTA module) provided by Heidelberg Engineering for investigational use only. Financial support was provided by the International Association of Government Officials Fund (LV) and a Research to Prevent Blindness Unrestricted Grant to Duke Eye Center. Dr. Vajzovic has received grants from Heidelberg Engineering; grants and personal fees from Alcon, Second Sight, and Roche / Genentech; and personal fees from DORC, Bausch + Lomb, Alimera Sciences, and Janssen outside the submitted work. Dr. Materin has received personal fees from Castle Biosciences outside the submitted work. Drs. House and El-Dairi have received grants from the Knights Templar Eye Foundation and the Lions Duke Pediatric Eye Research Endowment during the conduct of the study. Dr. Freedman has received grants from the Lions Duke Pediatric Eye Research Endowment during the conduct of the study. The remaining authors report no relevant financial disclosures. The authors would like to thank their ophthalmic photographer, Michael P. Kelly, for capturing the images. Address correspondence to Lejla Vajzovic, MD, 2351 Erwin Road, DUMC 3802, Durham, NC 27705; email: Lejla.Vajzovic@duke.edu.